These black full range mini cube bookshelf speakers may look cute, but they pack a big punch. They're great for home theater systems or stereos, and they look sharp on tables or bookshelves. These speakers are powered by 4' paper cone drivers pushing 200 watts, delivering a frequency response of 80 Hz to 18 kHz. They're also video shielded to prevent damage to CRT monitors. 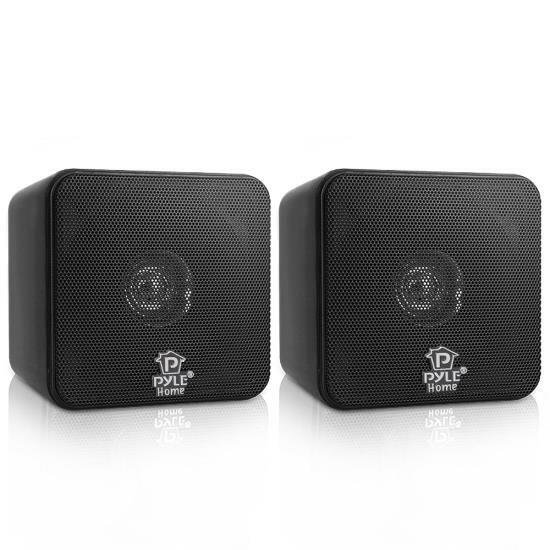 When you're looking for power in a small package, look to these bookshelf speakers from Pyle Pro. OK. So where do I purchase cables to connect these speakers to my TV? Should be an easy answer. Can't get anyone to respond.